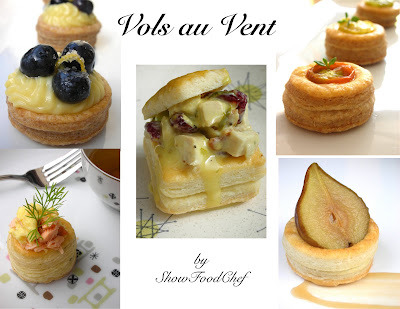 This is my second challenge with The Daring Baker's, and I had a kitchen party, all by myself, playing with these Vols au Vents. I turned flakier than the dough trying to decide: how do I want to fill them, how could I add my spin to the dough flavor, do I like them crispier or softer, are they better warm or at room temperature? Ultimately I made about 8 different kinds of Vols au Vents, and then used the scraps (we really need a better word for such luscious leftovers) to make Cinnamon Twirls and Cheese Buttons. When I was a child, my Southern Grandma made biscuits twice a day: early in the morning before the sun came up, and early in the afternoon before the sun went down. She was a farmer and the eggs were so fresh they were still warm, the water came from a well, and the milk was poured from bucket to bowl. Her biscuits were tall and flaky and sweet without using any sugar (I think it was the milk, but I've never been able to achieve this). Sometimes for our dinner she would lay a biscuit on a plate, pull the middle out of the biscuit, fill it with chicken stew and place the top back on. The chicken stew would ooze over the top. I'm sure she never heard of Vols au Vent, but that's what they reminded me of and it was a sweet, sweet memory. Isn't that one of the best things about cooking and food? Many things are better when they're home-made, and Puff Pastry is at the top of that list. Not only is this buttery, million-layered dough amazingly tasty; there are unlimited ways to use it, both savory and sweet. OK, maybe it takes you a day (on and off) to create this super-rise "omni-dough", but it freezes really well and when you present it...we're talkin' out-loud ohhs and ahhs. Take pictures just in case you need proof you created it yourself. Here's a visual guide to the steps, (using my Whole Wheat version) and the basic recipe after that. 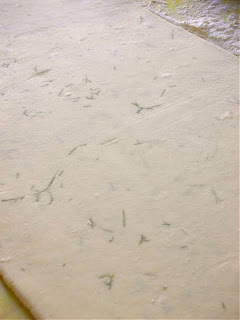 Below the Basic Recipe will be the tweaks I used for Fresh Dill-Puff Pastry, Whole Wheat Puff Pastry and all the fillings. Dock the solid bottom rounds with a fork (prick them lightly, making sure not to go all the way through the pastry) and lightly brush them with egg wash. Place the rings directly on top of the bottom rounds and very lightly press them to adhere. Brush the top rings lightly with egg wash, trying not to drip any down the sides (which may inhibit rise). If you are using the little “caps,” dock and egg wash them as well. *For additional rise on the larger-sized vols-au-vents, you can stack one or two additional ring layers on top of each other (using egg wash to "glue"). This will give higher sides to larger vols-au-vents, but is not advisable for the smaller ones, whose bases may not be large enough to support the extra weight. *Although they are at their best filled and eaten soon after baking, baked vols-au-vent shells can be stored airtight for a day. 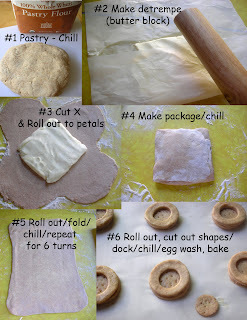 *Shaped, unbaked vols-au-vent can be wrapped and frozen for up to a month (bake from frozen, egg-washing them first). Create a compound butter by mixing 1Tbls. of fresh, chopped dill and 1 Tbls. of fresh lemon juice into room temp. butter. Then, chill the butter in block form and continue recipe as per Basic Puff Pastry above. 1 Salmon Fillet (cooked) I sauteed Salmon fillet in Olive oil, s&p, then cooled. Whisk eggs with cream, salt and dill until light and frothy. Pour into heated skillet (on Med/High) that has a drizzle of olive oil. 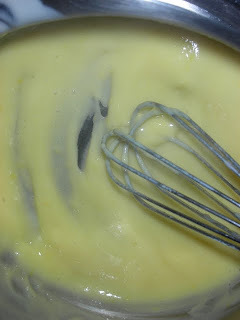 Let eggs cook for a moment then gently turn over in lumps with a large spoon. Remove from heat while still a little runny, as the eggs will continue to cook while off the heat. 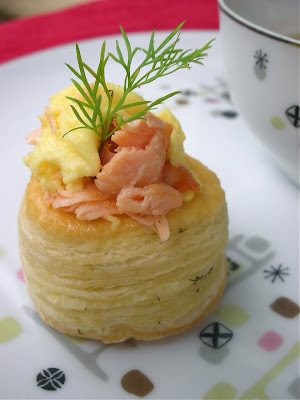 Cut Cooked Salmon into small cubes/pieces and fold into the scrambled eggs. 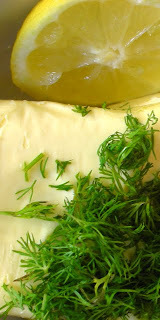 Spoon mixture into the Dill-Vols au Vents and garnish with a sprig of fresh dill. Place in a baking dish, cut side down. Add a few Tablespoons of water to the dish and bake pears for 15-25 minutes depending on kinds of pears and size. Chill pears or hold at room temp. while preparing the Caramel. In a saucepan, heat 3 Tbls. Butter, 1/3 cup Sugar, and 1 Tbls. Brown Sugar on Med/High heat until Caramel Brown. Stir in 1/4 cup heavy cream, and 2 tsp. lemon juice. Stir til thickened. 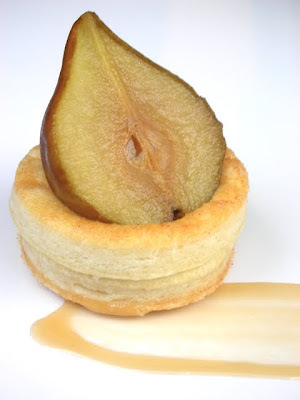 Put a small amount of Caramel sauce in each Vols au Vent, then place pear half on top in a tilt. Optionally: sprinkle with chopped nuts or drizzle with more Caramel. In a saucepan on Med. heat, add the mustard, honey, cream and tarragon. Salt to taste while heating and stirring until thickened. Cool and hold. 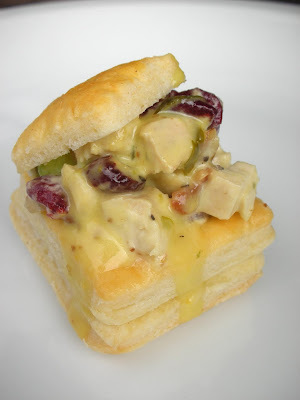 Combine cubed chicken, celery, cranberries, and bacon with enough dressing to coat well. 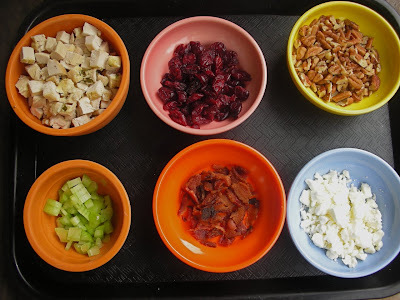 Add pecans and feta, fold together. Spoon into each Vols au Vent and drizzle more dressing to taste. Be sure to check out the other gorgeous, delicious ways to use Puff Pastry by our fabulous other Daring Bakers. Puff Pastry is worth the time and effort. Do the Puff! It's a cake, it's a cookie, it's a Madeleine. These are little sugar sprinkled spongy hump-back Nutella-flavored bites of heaven - that's what they are in a nut-shell shape. This is my September offering in the Nutella Challenge that the always adorable Bell'Alimento began a while back. I love developing recipes more than repeating them. So, this idea of sharing something new each month that has such a sweet and addictive ingredient like Nutella is a dream come true for me. 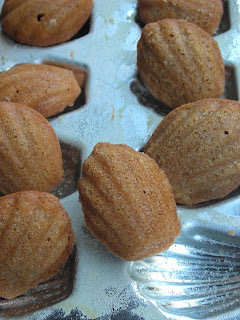 In the past, I have made Madeleines with coconut, tea, chocolate, sun-dried tomatoes, cheese, etc. and they can be a wonderful afternoon treat, or a nice light dessert to follow up a heavy meal. 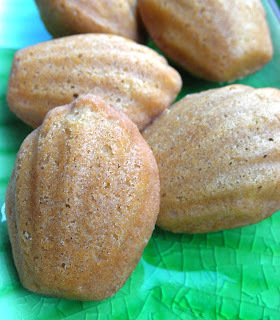 The savory Madeleines can also be a sneaky way to get healthy stuff into a kid's lunch box. 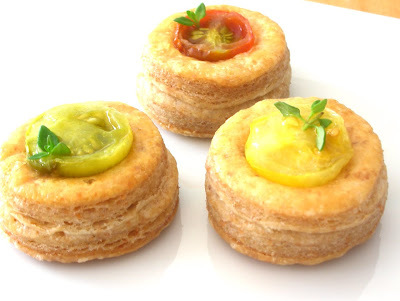 The traditional Madeleine is a french tea cake and there are several theories about it's origin. One story is about a Le Cordon Bleu Chef named, Madeleine, who created the light little cake for her very rich employer in the 19th Century. Another story is about a Duke visiting a small village in the 1700's and having a delightful little sponge cake cooked by a peasant girl named, Madeleine. 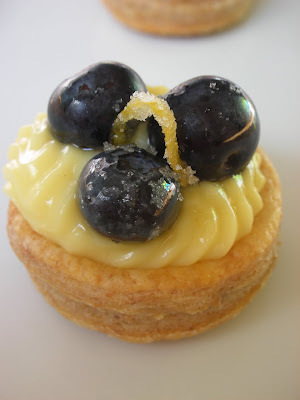 Evidently, he could not forget the "cake" so had his sister or cooks repeat the recipe and savored the sweet Madeleine many more times. Hmmmm. That one sounds like a movie waiting to be cast, don't you think? 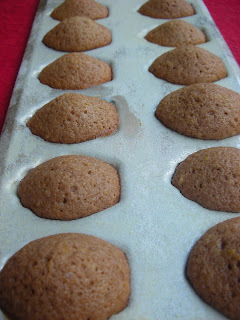 What-ever the origin, Madeleines are usually made with flour, butter (very often melted or even browned), eggs and sugar. If the traditional hump is desired - baking powder is also used. They are at their best when served as freshly made as possible, but can be held for a few days and on occasion I have even frozen them and re-toasted them to serve with ice cream. However; I would caution not to judge a Madeleine by the cellophane wrapped, dry, tasteless ones you may find sold at the counter of coffee shops. IMO. Because of Nutella's consistency and luscious fat content, I adjusted my recipe a little to incorporate the Nutella and yet keep the lightness of a Madeleine tea-cake. The Nutella flavor is subtle (incorporate more, if you like) and the orange zest really accents the "chocolate/hazelnuttiness" while also helping keep the moisture inside. Butter and Flour a Madeleine Pan (if using metal), not needed for a silicone or non-stick. In a saucepan, melt the butter over gentle heat, add the nutella to the pan and whisk together. 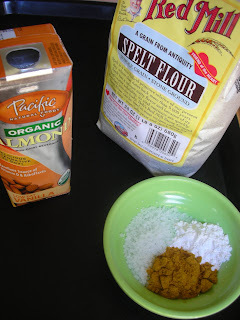 In a bowl, sift together the Flour, Salt, and Baking Powder and hold. In another bowl, whisk the eggs and sugar til light and frothy. Add the Orange zest, and the Flour mixture and whisk til incorporated. Add the butter/nutella mixture and whisk all together just til mixed. Drop spoonfuls of batter into each mold, filling 3/4 up. Chill for at least 30 minutes before cooking. Preheat oven to 400 F., and bake for 10-12 minutes (can vary depending on your molds). Before serving, sprinkle top of Madeleines with powdered sugar. I was tempted to split a few of these and sandwich them with more Nutella. Let me know if you're Nutella enough to try it. Enjoy! And to see the many incredible recipe ideas with Nutella, check out these amazing sites: Nutella Blog Roll. If I ever had a Vaudeville act it would be plate spinning. I can multi-task with the best of them. 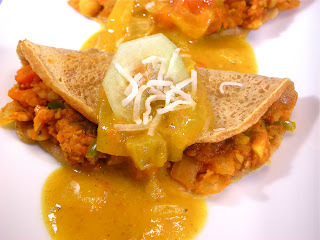 So when Debyi from Healthy Vegan Kitchen chose Indian Dosas (from the refresh cookbook by Ruth Tal) for the Daring Cook's September Challenge - AND- Slow Food USA was launching a Time For Lunch campaign to bring healthy food into our kid's schools by throwing a country wide Eat-In on Labor Day - my brain plates started spinning. 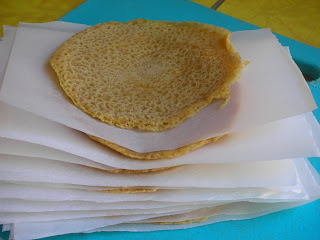 I followed the recipes as given for the Daring Cook's Challenge, but created the lacy Indian crepes into mini crepes that could feed a crowd. 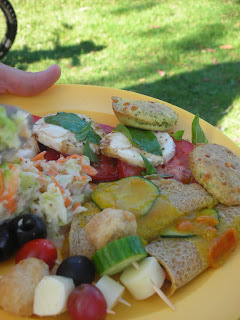 Then, I brought them proudly to my neighborhood Slow Food Picnic. 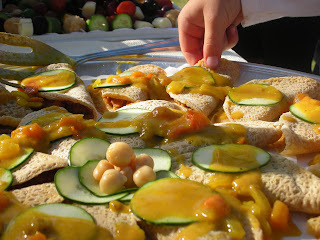 It was a large platter of fragrant, colorful, vegan delectables that were literally scooped up (with repeat visits) even by the youngest children. I was as proud as if I'd brought my grandma's buttermilk fried chicken to the preacher's invitation-only cover-dish dinner. I've never been vegan, and can't imagine giving up cheese, milk or fish forever, but - hey- that's why I signed up for the Daring Kitchen: to be challenged and stretched into areas that maybe I'd never pick on my own. After making the recipes as offered, I also did a little more research on my own (half the fun is learning other cultures, too.) 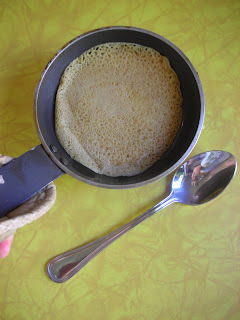 Okay, so the Dosa recipe we used was A way of making them and actually closer to Maida Dosas (fine milled wheat flour used on occasion in Indian Cuisine) than the older versions of Dosas that use rice and urad dal (lentils) that are soaked overnight, ground and fermented for hours before being made into a batter. 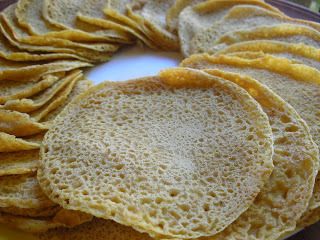 However; these Dosas were a great introduction and by using Spelt Flour (a very hearty and healthy grain) they became something that I would gladly make again even on a limited time schedule. I also discovered they freeze well, which makes it even more convenient for feeding a busy family that still wants to eat healthy. 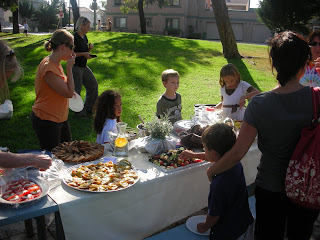 The Slow Food Eat-In on Labor Day had over 300 picnics happening all across America and was successful in gathering over 20,000 signatures on a petition to raise awareness in the USA to the need for better nutrition in our school lunches. I'm including a few pics from our small neighborhood picnic because the food was just so darn delicious looking and tasting. 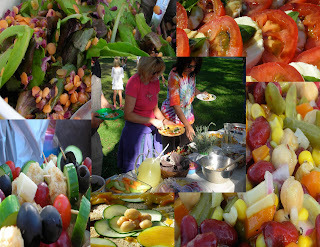 It was inspiring to see families setting an example by eating fresh foods with their kids, talking about the farming, etc... And, to see small kids grabbing skewers of tiny tomatoes and fruits and eating them like/instead of candy - well, that was just the coolest summer day yet. 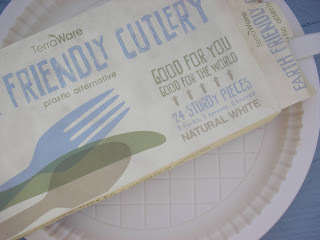 Slow Food USA supplied flyers, and plenty of bio-degradable plates and utensils. And NOW to the recipes. 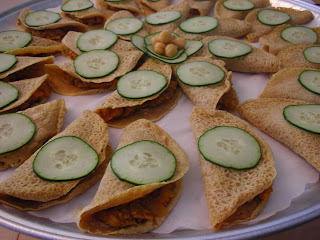 There are three parts to the whole Dosa experience that we followed. 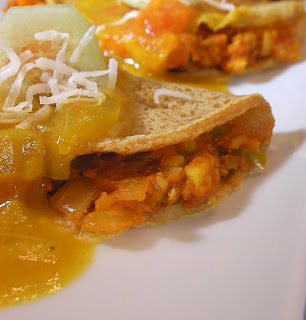 2) The Curry Garbanzo Filling (which can be made and frozen for later, and can also be used as a topping for rice, so making the whole recipe is just simply smart. 1.Combine the dry ingredients in a bowl, slowly adding the almond milk and water, whisking until smooth. This can get gummy, go at it little at a time. 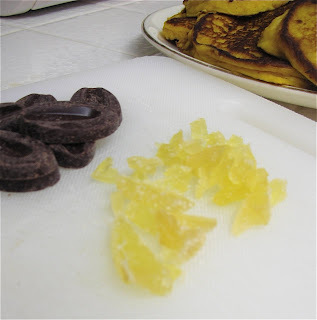 ** In my case, I used a small pan and I did add a little more almond milk to make just a bit thinner batter. Was it worth it? Yes! Was it delicious? Yes! Would I make it again? Yes! During the month of September, Slow Food USA is opening their membership to anyone for any amount they can pay. I hope you'll look into right here. Daring Kitchens are open to all interested in a cooking/baking challenge. I hope to read about your experience next. AND you can read about the other blogs right here. This is my first Paper Chef challenge. I stumbled upon this challenge while enjoying Deeba's Blog who coincidentally is the judge for this challenge. Evidently the Paper Chef challenge is one of the oldest running food challenges and it seems truly fun and wide open for imagination. For the 44th event, we were given the ingredients of: Ricotta, Dark Chocolate, Ginger and a theme of Fall to be worked in seasonally. We can use other ingredients (ala Iron Chef rules), but the ones chosen are an absolute. 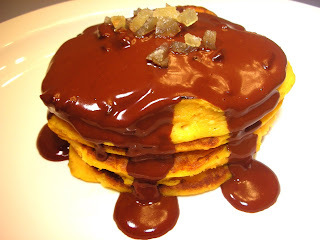 I created - Pumpkin Ricotta Pancakes w/ Chocolate & Candied Ginger syrup. The stack used in my picture didn't make it back into the kitchen from my little photo shoot before my husband ate them. The rest I saved as they make great "toast yourself" breakfast goodies for my teen-age son. Sift all dry ingredients into a bowl. In another bowl, whisk the eggs, ricotta, pumpkin, milk and zest. Add the dry ingredients to the wet ingredients and stir until mixed well. Heat butter in a skillet on Med. and add 1/3 cup of pancake batter for each pancake. Flip each when the edges bubble, heat til cooked through and hold on a warm plate until ready to serve. In a saucepan, heat the cream, soy milk or coconut milk til just simmer. Pour the heated liquid over the chocolate pieces and candied ginger in a bowl. Stir to melt and add more cream to your liking. Keep warm for serving. Garnish with more chopped Candied Ginger. 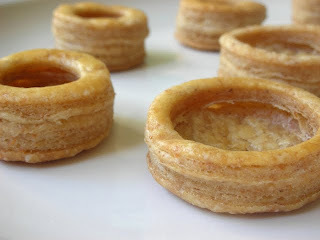 These are also delish with whipped cream or maple syrup. Also, try whipping a TBL. of chilled pumpkin puree into your whipped cream for color and extra pumpkin zing. Today's "Let's Lunch" (the international virtual lunch date) entree is a chilled soup. Since it was coinciding with Back-To-School time and a Welcome Luncheon for teachers, I decided to go for apples. And looking for every chance to make the clean-up extra easy - why not make the bowl edible too? This is my Apple Bowl Curry Soup; ABC Soup for short. The Let's Lunch group is an open invitation idea started by several creative Food Bloggers on Twitter, who were literally across the world from each other. It has become a delicious way to connect on lunch ideas, swap recipes and inspire each other. Now there are a whole group of us, and YOU are always welcome to join in the fun. You can find out about the next "Let's Lunch" by searching #letslunch on twitter, following any of us on twitter (@cheryltan88, @cowgirlchef, @showfoodchef @geokaren, @PinchMySalt, @thenaptimechef ,@blogwelldone,@istelleinad,@barbraaustin, @cosmiccowgirlt, ), or leave a comment here. This is a very simple soup that has just a hint of curry and mint to give it interest and range of flavor. It does require a hardy crisp apple for the best bite and chilling the apple before cutting makes it easier to scoop out and maintain it's shape. To prepare the apples, have fresh lemon juice handy to rub over and inside the apples so the flesh doesn't turn brown as it oxidizes. Slice the wide top end from each apple, about 1/4 way down. 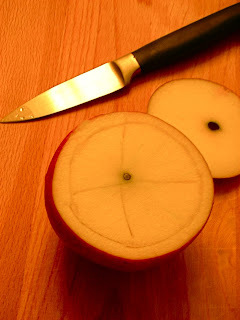 Using a paring knife, carefully score around the inside of the apple, leaving about a 1/4 inch rim. Score an X across the apple to help break the core. 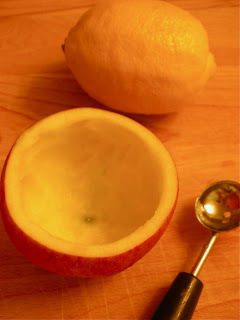 Using a small spoon or a melon baller, scoop out the flesh of the apple, being careful to leave a good bottom inside and not cut through the apple skin. Be sure to keep all the scooped out apple for the soup, discarding the seeds and core. Rub the cut rim and the insides of the apple bowl with fresh lemon juice to help keep the fresh color. Turn the prepared apples over on a parchment covered plate and chill in the refrigerator while preparing the soup. In a sauce pan, heat the olive oil on medium and saute onion, apple, curry, salt and pepper until the apple is soft. Add the stock and mint leaves - simmer low for 40 minutes. 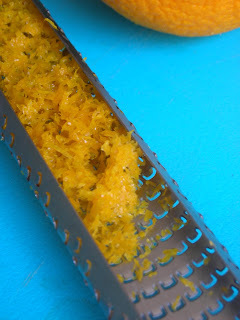 Cool, then add lemon juice and puree for a thick, rich soup. Chill well. Pour to serve. 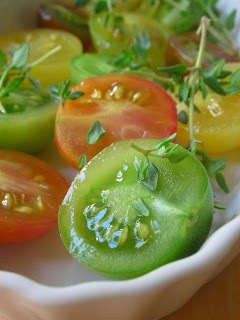 Garnish with creme fraiche and mint sprigs. 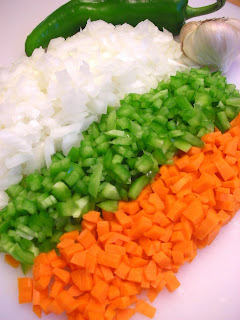 **For a thinner soup, just add more stock to the simmer. 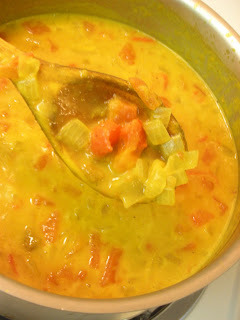 ** For more of a dessert soup, leave out the curry and add a tsp. of brown sugar instead. Enjoy, but don't leave this apple on the teacher's desk - it might spill.